Preliminary Jackson High School boundary map. Image courtesy of Everett Public Schools. Failure of the Everett School District’s February 2018 construction bond measure required board members to figure out how to reduce overcrowding at Jackson and Cascade High Schools without building a new high school. Although the measure received 55% yes votes, a super-majority of 60% was required for passage. Right now Jackson High School is almost 400 students over capacity and utilizes 17 portable classrooms to house students. They figure an additional three portables will be needing for the 2019-2020 school year. As a first step in the fall of 2018, the school district formed a 30-member committee comprised of students, parents, and school administrators from the affected community schools. Their charter is to deliver their recommendations for dealing with high school overcrowding. At the top of the list is redrawing high school boundaries to shift students from the overcrowded south end to Everett High School, which is under capacity. The preliminary maps released by the boundary committee show specific neighborhoods from which students will be bussed beginning in fall 2020. Seniors who live in the affected areas will be allowed to remain at their respective high schools, so only students in grades 9 through 11 would be bussed. The maps show that in the 2020-2021 school year approximately 760 students would be bussed from Jackson to Cascade, and 612 students would be bussed from Cascade to Everett. Wednesday, February 6, 2019, Gateway Middle School cafeteria, 6:00 to 7:30 pm. Thursday, February 7th, Cascade High School cafeteria, 6:00 to 7:30 pm. 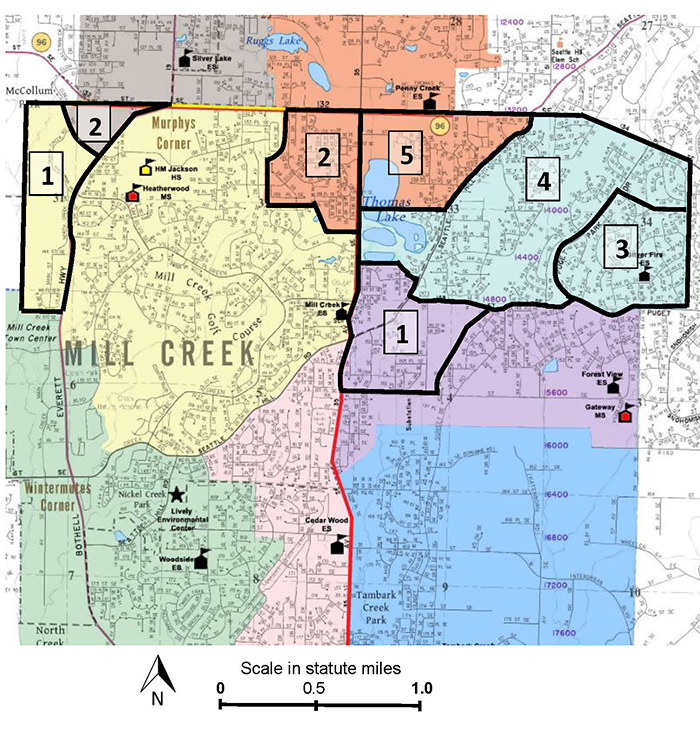 High School Growth Mitigation Planning Committee | Community input needed. Preliminary Cascade High School boundary map. Image courtesy of Everett Public Schools.